For more than 50 years, Weber charcoal grills have been one of the top sellers in the BBQ industry. Their kettle style grills are one of the most popular charcoal grills of all time, and this is due to Weber's solid performance and dependable quality. Weber charcoal grills are portable, lightweight, and our huge selection includes all the sizes and colors available from Weber. Since Weber Grills released the iconic Weber Kettle Grill in 1952, they have become the biggest name in BBQ. For over 60 years, Weber has been a leader in the BBQ industry, and for good reason. Weber charcoal grills are tough, built to withstand years of outdoor cooking. The original circular design of the Weber Kettle Grill has been adopted by many other charcoal grill brands due to its superior heating ability. When it comes to charcoal grills, Weber offers a cooking experience that is unmatched by any other brand. Built to Last- Charcoal Weber Grills feature a tried and true design and solid engineering. Weber believes in the quality and craftsmanship of their grills, and offer the warranty to back it up. If you want a charcoal grill to last decades, then this is the brand for you. Superior Heating and Temperature Control- The circular shape of Weber Grills creates a convection heating system which cooks evenly and consistently. Hot and cold spots are a relic of the past with the charcoal grills Weber offers today. Their heat dampening system allows for excellent temperature control and longevity of fuel. Easy to Clean- With the patented One-Touch Cleaning System in Weber Grills, charcoal ash can be removed quickly with one hand. The porcelain-enamel blast-fired coating allows for effortless removal of soot with just some soapy water. Wipe down your Weber and it will shine like new. Outstanding Customer Service- Weber is well known in the BBQ industry for having excellent customer service. They go the extra mile to ensure that every purchaser of a Weber charcoal grill finds a solution to any problem they encounter, and always feels satisfied with their grill. Great Value for the Price- Weber offers a charcoal grill for everyone. Weber grill sizes range from the 14 inch Smokey Joe Portable to the 37 inch Ranch Kettle. The Weber Summit is widely considered to be the best charcoal grill Weber has ever produced. With nine collections of charcoal grills, there’s a Weber to meet your needs. BBQGuys has the largest selection of charcoal Weber Grills available, and our BBQ experts are standing by 7 days a week to answer any questions you may have about this iconic brand. We can help you find the Weber grill that will keep you and your family cooking for years to come. 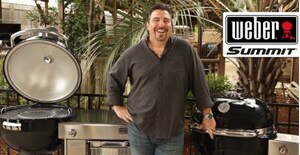 See the complete line of Weber grills and BBQ gear.